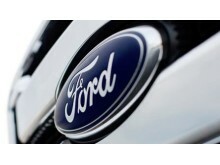 Europas salg af SUV'er er stigende. 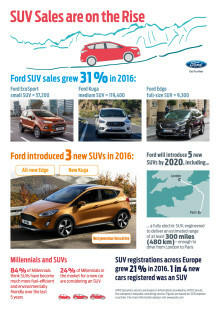 Desuden introducerede Ford 3 nye SUV'er i 2016; Den nye Edge, Kuga og den næste generations Fiesta Active. 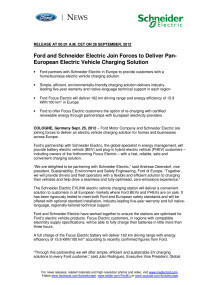 Ford Motor Company and Schneider Electric are joining forces to deliver an electric vehicle charging solution for homes and businesses across Europe. 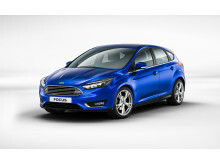 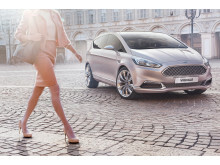 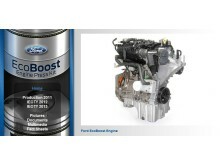 Ford’s partnership with Schneider Electric, the global specialist in energy management, will provide battery electric vehicle (BEV) and plug-in hybrid electric vehicle (PHEV) customers with a fast, reliable, safe and convenient charging solution.